Humans have lived in Hong Kong for 30,000 years, but did not enter the history books until the third century BC. In the year 221BC, Hong Kong was incorporated into the Qin Dynasty. For many centuries, it was just a small town, supported by the fishing and pearl industries. 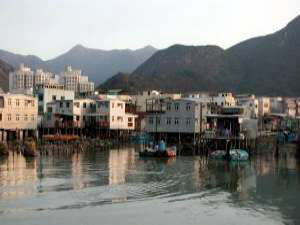 Starting in the tenth century, the area became an important economic center due to its location on the Pearl River Delta. In 1276 AD, Hong Kong, specifically Kowloon, briefly became the seat of the Song Dynasty as Mongls invaded the rest of China. Hong Kong's importance increased and its population grew as Chinese refugees streamed in. In 1513, Portuguese explorer Jorge Alvares arrived, beginning a new era in Hong Kong's and China's history. The Portuguese were soon expelled by the Ming Dynasty, but the floodgates were open. The British East India Company set up shop in 1699, and Hong Kong quickly became a center for international trade. By the end of the eighteenth century, the opium trade was in full swing. The British traded opium from Afghanistan to the addicted Chinese in exchange for luxury items. The Qing Dynasty banned the trade in 1839, leading to the Opium Wars. The British won handily, and as part of the treaty of Nanjing in 1842, they gained control of Hong Kong Island. Treaties in 1860 and 1898 would expand British control to all of modern Hong Kong. Under British rule, Hong Kong flourished. It became an international hub of finance, commerce, and industry. The population exploded. The British also instituted western style education, and promoted free trade. This Golden era continued until World War II, when Hong Kong was invaded and occupied by Japan for three years. Citizens suffered through hyperinflation, food rationing, and abuses from Japanese troops. After the Japanese defeat, though, Hong Kong quickly bounced back. The British were back in control and Hong Kong entered another era of rapid economic and population growth. As the population grew, the only place Hong Kong could grow was up. Skyscrapers began to spring up everywhere. In addition to being a center of finance and manufacturing, Hong Kong was also becoming a center of culture. The city became a hub of arts, music, and the cinema. In the 1980s, China and Great Britain reached terms on a peaceful transfer. In July 1997, Hong Kong became a part of China for the first time in 150 years. Since then, the city has continued to thrive. Hong Kong remains a center of finance, trade, culture, and is one of the world's most popular tourist destinations. During the latter half of the twentieth century, Hong Kong was again administered by Britain. It was during this period that the city began to grow into the thriving metropolis it is today. The city quickly became a central manufacturing center and one of the world’s hotspots for trade. As Hong Kong grew economically, it also began to develop culturally by developing large arts, music and cinema industries. The British and the Chinese formally agree during the 1980s to peacefully transfer Hong Kong back to the Chinese government; the process was complete on the first day of July in 1997. Today, Hong Kong has one of the largest ports in the world and is one of the world’s most visited cities measured by international tourist arrivals.